I’d always been that weird kid in class who no one really liked that much. I was called He-she, It, Dyke, Transvestite, Sir. This is from people I went to school with since kindergarten. I got pushed up against a wall in eighth grade by a girl I’d known since third grade. From the time I was in school until my mom pulled me out to be home-schooled, I was really, really, really angry. I acted stupid. After I left school I started to calm down more, and was happier. Less punching holes in walls and throwing hissy fits about everything. I didn’t have to deal with people calling me names. I felt more free. One morning about two years ago my mom tried to wake me up to go to school and I refused to go. And she’s like, “If you don’t go you’re grounded, blah blah blah.” I told her, “You don’t know what it’s like to go to that hell every day.” Every time I went to the bathroom someone was calling me a man or tormenting me. My mom went to the school and called me back 30 minutes later. She said, “Well, you’re not going there anymore.” I was living with my dad before, and I don’t think he realized the extent of the bullying. He basically laughed at me and said, “You’re gonna deal with high school like everyone else.” My mom realized a little bit more. I came out at, like, 12 years old — first as bisexual. I thought I liked guys a little bit but I really did like girls a whole lot. I came out to my mom before I came out to everyone at school. I was like, “I have something to tell you,” and I couldn’t get it out. And she said, “You’re not sexually active, are you?” And I’m like, “God, no. I’m kind of bisexual.” She’s like, “You’re 12. You don’t know what you’re talking about. Go back to sleep.” But now my mom is a PFLAG (Parents, Friends and Family of Lesbians and Gays) mom and has rainbow stickers all over her car. And I was kind of scared to tell my dad. But he was like, “Whatever tricks your trigger. Just don’t be tricking it too early.” Then we’d be checking out girls at Wal-Mart. My dad died last year, so he didn’t get to see all of the activism I’m doing and what I’ve accomplished. When I came out, I dated all these girls and maybe two guys. Being the only gay person out in school, girls would come up to me and say, “So I’m gay.” Even if I was just friends with someone and walked them to their locker, there’d be a rumor they were gay. The girls I dated weren’t out, and they were very feminine. I dated a cop’s daughter and the youth group leader’s daughter. That was when I was in school. I was kind of a little player, confident and cocky. The year after I left, a lot of girls at my school came out. They didn’t really get teased because they dressed feminine. A lot of people aren’t comfortable with a girl who dresses like a guy. I know I’m a female, I just look like a guy. I know I’m not transgender, and that’s what people around here don’t understand. I got involved with gay activism last year. I watched the TV network LOGO a lot and I saw a movie, I can’t remember what it was about, but they mentioned PFLAG in it. And I was like, “I wonder if that’s real?” So I went and Googled it and I found a chapter in Laurel. 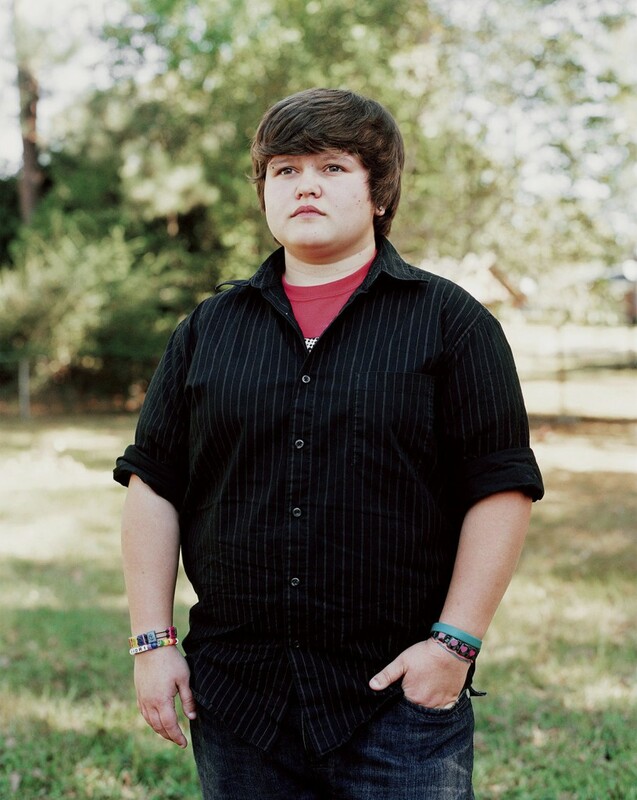 Then, at the second meeting at PFLAG, the Mississippi Safe Schools Coalition came. I wanted to get involved more and help people not have to go through what I went through. I want other kids to be able to go to football games and pep rallies and have the high school experience. I’ve gotten to go around Mississippi and speak to people. I’m 15 years old and talking to college kids, and I’m like, “This is the problem and here’s how we’re gonna fix it.” It made me grow more and learn. There are some things I missed out on by being home-schooled. Me and my friends drifted apart a little bit. I did think about going back but I don’t regret being taken out of school. I’ve done so much at 15. I want to start college next year so I can get out of this stupid town, which I can’t stand. I’m ready to get started and get on with the rest of my life. And this is gonna sound bad, but it kind of warms my heart that all these people who picked on me are idiots who are barely passing. They’ll be starting 11th grade and I’ll be a freshman in college. I want to stay in Mississippi for college. There’s gay flight in Mississippi because everyone thinks it’s so horrible, so they leave. And nothing ever changes when all the gay people leave. Conservative people will never be used to a butch lesbian holding another girl’s hand, or two guys holding hands, if they don’t see it. There’s lots of work that needs to be done and it really makes me happy to get to do it.